London/Lisbon, UK/PT, 03 July 2018 – Amiko Digital Health Limited (Amiko), a company that develops advanced medication sensor technologies and digital therapeutic solutions, and Luz Saúde, one of the largest health care groups in Portugal, today announced a partnership to help drive innovation in respiratory care. 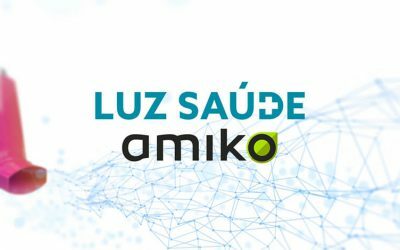 Luz Saúde will integrate Amiko’s Respiro platform into asthma and COPD care, enabling nurses to optimise respiratory treatments and support patients to self-care, to improve outcomes and lower healthcare costs. Respiro offers inhaler sensors that automatically capture data on the patient’s inhalation profiles to monitor when and how well patients use their respiratory medication, and digital adherence tools for the provision of personalised medication use reviews. Francisca Leite, director of Hospital da Luz Learning Health, believes that digital therapeutic solutions have the power to revolutionize respiratory treatments. “Amiko has a great product that will completely change the way asthma and COPD patients and their health providers can improve the efficacy of the treatment. Using Amiko’s solution I am certain that respiratory patients will feel an important improvement in their health status”. “Our partnership with Luz Saúde is a testament to the unique flexibility of Respiro to effectively integrate into drastically different healthcare structures and deliver system-wide value. The unique capabilities of our sensor technology for inhalers address a fundamental unmet need in respiratory care – the sub-optimal performance of respiratory therapies in the real world. We are thrilled to deliver Respiro with a leading European healthcare network that is dedicated to innovation and upgrade their standards of care using connected technologies” said Duilio Macchi, CEO of Amiko. Founded in 2015, Amiko is growing to become a global provider of sensor technologies for drug delivery systems and digital adherence solutions. Amiko has the ambition to offer a full range of technologies to collect data on delivery systems usage, including inhalers, nasal sprays, nebulizers, injectables, or pharmaceutical primary packaging. Amiko’s flagship product is Respiro, a connected respiratory disease management platform that enables advanced tracking of respiratory medication use for improved adherence and treatment effectiveness. Development of specially designed residences for seniors – senior residences with services.